This home exterior includes accented stone and window shutters for popular curb appeal. Adding French doors to the den provides privacy while still remaining bright and open. Flexible space offers the option to be used as a den/ home office or it makes a perfect formal dining room. Large gathering room with fireplace and Pulte Planning Center® nearby and tile flooring. Built-in high-quality appliances and custom cabinetry complete this chef's kitchen. 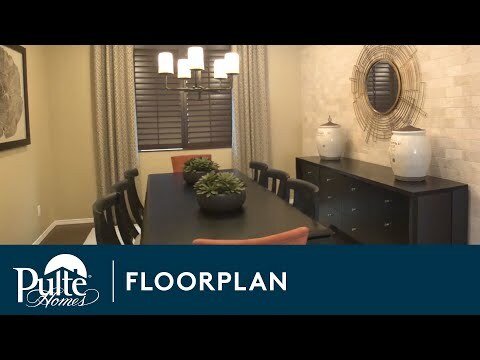 The Pulte Planning Center® - a centralized space for charging electronics, paying bills, homework station and more. Upstairs loft creates the perfect movie room or flexible room to use how you see fit. Cafe off the kitchen easily seats six for casual dining or busy morning breakfast meals. Beautiful iron stair railing takes you from the first floor to the second floor loft and bedrooms. The loft and game room on the second floor provides two additional living spaces for the entire family. The game room option upstairs provides additional living space for games, movies and family memories. Plenty of space in the Carissa with the loft plus game room in addition to the gathering room and den downstairs. Relaxing owner's suite with bright bay windows and decorative ceiling light fixture. Private owner's bath is complete with dual sinks, a large walk-in closet and different shower configuration options. The tile walk-in shower in the owner's bath feels like you're at the spa and is private from the rest of the bedrooms. Welcoming two-story foyer greets and impresses guests as they enter into the Carissa. Carissa home exterior with neutral color tones and the space for up to seven bedrooms. The home exterior option C of the Carissa includes accented designer features. A cozy fireplace in the gathering room provides warmth and ambiance on those cool New Mexico evenings. Balcony off the game room provide attractive views and a place to relax outdoors. Add a fireplace in the gathering room with the option for designer tile features. Brand new kitchen with trendy cabinetry, granite countertops, a fun tile backsplash and built-in appliances. Easily flow from room to room while entertaining guests with the openness from the gathering room to the kitchen. Kitchen island seating provides a casual space to enjoy morning coffee or breakfast with the family. The versatile Carissa is designed with the entertainer in mind, featuring a spacious first floor with open gathering room and kitchen leading to the covered outdoor patio. The flexible second floor has a large loft with an optional guest suite or extend the loft with a game room and balcony. The Carissa offers up to seven bedrooms, so you have plenty of space for overnight guests. Plus you can enhance the exterior of your home with a gated courtyard. Step inside Carissa to see the Life-Tested Home Designs® with more usable space where you want it most. So you live the way you want to live. Two-story ceilings in the foyer greet you as you enter the spacious Carissa, known for open living spaces and its pop-up loft and bedroom. Beautiful cabinetry and granite countertops enhance the open island kitchen, which also features a walk-in pantry. If additional bedroom space is needed, the Carissa has options for two more bedrooms.